And Hardline was pretty forgetable. Ea completley owned dice in 2006, they had majority shares in 2005. So time for claws to sink in deep has no merit. What has changed is the markets, technology and the internet. These three things combined have changed gaming more than any publisher. Has technology and the internet devolved? I recall playing 10vs10 matches in CS almost 20 years ago with excellent ping, on a freaking dial-up modem! EA can no doubt deliver better but it cuts into their bottomline so they won't. Yeah but dont forget how awful the graphics and map quality. Games have much more going on now. 20 years ago those graphics were decent, I recall one of my favorite custom maps Deliverance having plenty of foliage and detail. If it was me developing games I'd put focus on graphics every other game and playability the one between, not focus on graphics above all every time. I know but you cant compare what happened 20 years ago to now. The progression in graphics, features, etc, has not been linear. The exponential growth, along with the exponential increase of people on the web compared to the slow improvements of the internet is why you comparison on how online gameplay compared in the past is not a fair assessment. So I should expect a worse gaming experience than 20 years ago because we have progress, right. 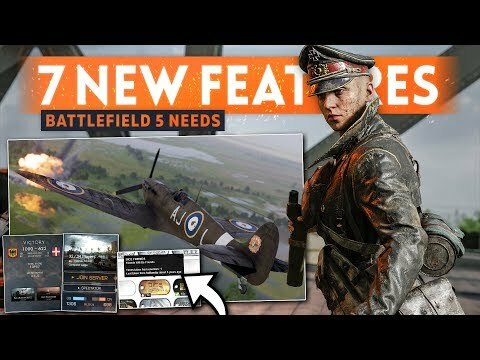 it's great to see that finally some of the youtubers are starting to sprook the importance of a RSP to the BF community... the unfortunate thing is that they should of started at least 6 months ago, even though there was some mention of it.. for some reason it was dropped like a hot potato and shelved. I have no dought that once ( or if ) a RSP is officially announced for BFV there will be a sales spike in the upwards direction, especially on the PC platform. I am glad the rental server system is a thing of the past. If you can not handle the responsibility of managing a server, then you should not be able to rent a server in the first place. BF4 was full of admins abusing their "rights". Just look at the current state of BF4. Admins baiting players with fake numbers of players. Well done EA/DICE. I have literally been baited into more servers on BFV with fake numbers than I ever have been on BF4. Actually, it was the reason I decided to go to bed and turn it off last week. Haven't played since. This BFV server situation is a damn quagmire. I was always proud of Battlefield not being CoD, not so much anymore. The silence from EA regarding the servers is disheartening. The bfv game does look better but the game play in Bf4 was was a lot better. I will give up pretty for game play every time. To be fair to our youtube overloards, they've been asking about RSP in all of their developer interviews since they started in regards to BFV. They've been shut down every single time with answers like "we will not be discussing that at this point in time" and "we'll let you know as soon as the roadmap is finalized." At least JackFrags and Westie have been doing this very actively. Hardline was developed by Visceral Games not DICE. In every BF server I’ve gone into, the number of abusive players far outnumbered the number of abusive admins. Based on your logic, EA shouldn’t sell a single copy of BF V because of all the abusive players. And if you have never run or adminned a BF server, I suggest you try it first before you make suggestions on what admins should or shouldn’t do. Yup, but I'm not sure if that actually matters. I'd want to believe that Visceral taking the wheel would have given the Dice studios more development time, but they developed Battlefront 2015 and Mirrors Edge Catalyst prior to Battlefield 1s release. That's a lot to work on, and I would be surprised if Visceral did anything outside of allowing Dice to squeeze in an additional game into their development cycle. I figured there would be a rush job and a month after launch to have a rush job RSP program again for BF5 like there was in BF1. With EA wanting to please shareholders and the fact that their shares have dropped to sub $85 from just over $150 in July I would think it would be even more important due to lack of sells of this game. If EA does, I still expect a rush job just to get people to buy the game. I am still holding firm, I will buy the game 1 month after launch of a rental server program if there are players. Near as I can tell, it will take several months and there player count is way short of what BF1 and BF1 was at their launches. I caved last week for the $29.99 Target special but it's still in the wrapper. If it gets to $20, I would consider it comparable to Early Access in price and thus hard to resist. Sad on no RSP news thru March on Roadmap, I know longer expect it. If it is offered, likely a half hearted attempt (BF1) in summer, too little too late. Good grief, Battlefield is truly dead then. It's sad. It's been dying for a while now.. but absolutely no server rentals is where this is headed. People are going to have to find a new FPS from a smaller developer who appreciates it's player base, doesn't mock them. Agree RSP has been mentioned, but I do not expect it, in any usable way, for BFV. BC2,BF3 had rented servers available at launch day, same goes with BF4 and BFH. BF1 was the first game that didn't have rented servers available at the launch. And this comment is from PC. Consoles never had RSP at launch date. Dude you deserve mocking..... you haven't been the game for the last two years ??? still back in BF4 I suspect or worse still PUBG ?? what have you been playing. 50 servers a night here in Aust even BF4's hey days weren't that big. Had no problems getting 3 squads of 4 all in TS into a conquest server last night. And maybe a little less demanding of RSP and start asking for free custom servers like there are in Titanfall, SWBF 1, BF1 Incursions. You guys are such sad sacks, If you look at the origin access model they will have to move towards free servers so anyone can download the game and play against a group of friends. This is what "games as a service" model is all about. If EA can get 10 million subscribers onto premium then that's 100 million a month in revenue and overt a billion dollars a year without selling a game. And you think you are smarter then them buy boycotting there game, they will win in the end just like steam did and they will get your money. While I understand your point, RSP is needed for the communities/clans. Is needed also for clanwars/events. PC yes, you are correct. My rig was sufficiently dated during BC2 that I played console during BC2 and for the first few months of BF3 before returning to the glorious PC Battlefield experience so the PC portion did slip my mind.